1. Cook the potatoes in boiling water for 15 minutes. Cut the beans into thirds and add to the potatoes for the last 3 minutes of cooking time. Meanwhile, make the dressing by combining the mustard with 1 tbsp olive oil and 1 crushed garlic clove; set aside. 2. Combine the thyme with the remaining olive oil and garlic and season. Rub all over the chops. Heat a griddle pan and cook the chops on a high heat for 5 minutes each side, until cooked through with no signs of pink. 3. Drain the beans and potatoes and return to the pan. Stir through the mint, dressing and spinach, then place a lid on the pan and steam until the spinach has wilted. 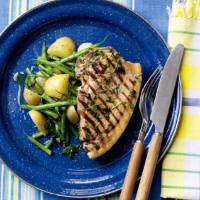 Season and serve with the griddled pork.